Not happy with the speed with which your bathroom or kitchen sink drains? Have you already tried a drain cleaner and the water continues to drain as slow as before? 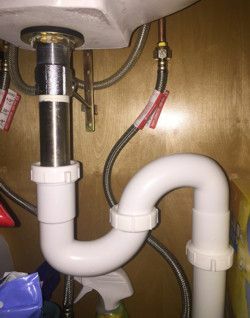 If this sounds like something you have been experiencing, then consider increasing the size of your sink drain and P-trap to sped things up! There are two sizes of drains that are typically in homes... 1-1/4" and 1-1/2". Sizing up to 1-1/2" drains can make a noticeable difference to the speed with which your sink drains. The result is a sink that stays clean easier and one that doesn't fill up when in use. Please note, it is not always possible to "size up". You will want to measure the drain pipe that goes through the wall (or floor) and be sure that it is the larger 1-1/2" size. If not, increasing the size of the rest of the drain will not have a positive effect. For questions or concerns, stop into our Plumbing Department for more on this helpful tip!